Best Beach House in Santa Cruz ! Stroll 5 minutes and you are at the 'Hook' surf location with beach stair access. Walk a little further and you are at Pleasure Point - home of many surfing contests. Several sets of good stairs down to the water. * 3 miles from Santa Cruz Harbor. Wednesday night sailboats races! * Close to Santa Cruz Wharf - 5 miles and the famous Boardwalk. * Nisene Marks State Park - redwood forest - great for biking and hiking -a 10 minute drive. Wonderful home with ocean views, decks to lounge on, beautiful gardens to stroll through, complete with hot tub and chiminea for toasty fires. 3 bedrooms, each with private bathroom, pilowtop queen beds, quality linens and down comforters. Extra queen bed in family room. Fully equipped kitchen with many William Sonoma kitchen supplies, high end front loading washer/dryer. Kamado ceramic barbecue and cooker. Beautiful decks for lounging and gathering. WIFI. Garage for one car with bicycles, beach toys and equipment and coolers. Ready for a carefree and relaxing vacation with friends and family! I lived and worked in Santa Cruz area for 10 years. My kids attended Soquel schools. Hope to retire back to Santa Cruz ! We are across the street from the ocean cliffs and have water views through the houses across. Great room area with beautiful sun room! Plenty of great dishes and utensils! Direct TV with HBO! Apple TV with Netflix and Pandora! Boogie boards, beach toys, blankets, coolers, beach chairs, many wetsuits! Key to Privates Beach, just down the street, Owner/Manager at times may be in studio at the back of property to manage the house. No common areas. We will enter down the left side of the property. You have complete privacy. The house was beautiful! Photos don’t do it justice. It’s a a dreamy retreat! The house is perfectly stocked with everything you’ll need. 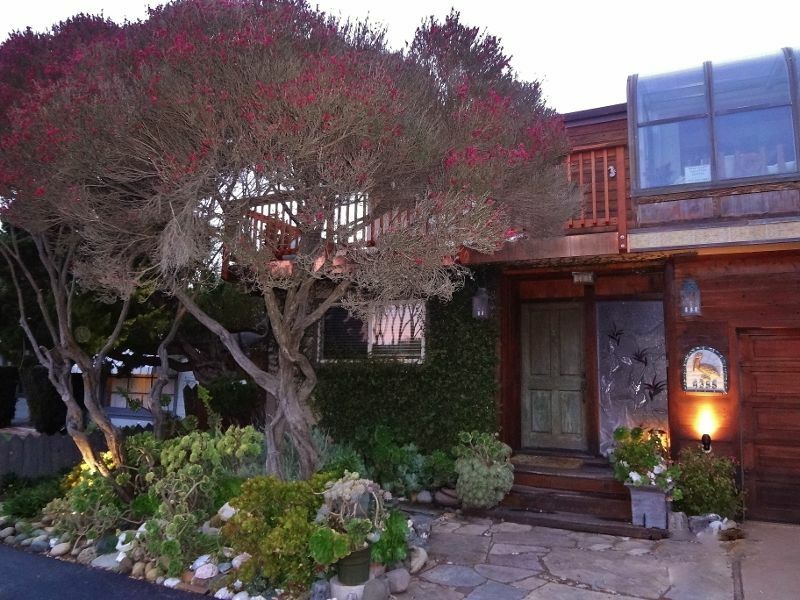 Beds are comfy and the location is beautiful, perfectly situated between pleasure point and downtown Capitola. The sunrise every morning in glass living room was beautiful. The backyard is lovely and peaceful. We had plenty of space for the four of us and our two dogs. We’ll be back! One of the best places we’ve stayed in Santa Cruz! A clean, eclectic and comfortable home at the beach. Highly recommended! My grandkids called it the "Glass Castel"
This is wonderful home with everything you need and plenty of space for everyone. The downstairs was perfect for the grandkids and my son to just hang out and play and watch T.V. while the grandparent's sat upstairs reading, talking and just watching the rain drops fall in the sun room. Joyce (owner) responded to any of our needs or concerns but really just left us to ourselves to enjoy our Thanksgiving holiday. This was truly one of our favorite rentals of all time. The home felt like a “home”, as if I was visiting my family for a weekend getaway to the beach. It was spacious, clean, beyond comfortable. I wish I could hear the stories behind the house and all the wonderful pieces of art. We will defkjolltu stay again. It was also very easy to check in and out and the owner was very responsive. Quirky but serviceable home in wonderful location. A good layout for multiple adults who need some privacy. Comfortable beds--all the essentials and more in the kitchen. No check in/out on Saturdays or holidays. During summer - weeks are general Monday to Monday, but call No charge for pets - great fenced yard $1000 deposit for summer reservations, non-refundable - non cancelable 60+ days, forfeit any deposits Security deposit is $500. This will be promptly refunded to you after your departure if all is well......no loss, no damage and specifically - no additional persons (above 8 unless authorized), no additional cars over 4 and no extended parties/events. Apologize, but a few negligent persons have caused this. I am at risk of losing my license with Santa Cruz County for a vacation rental if I do not comply with occupancy, car, noise restrictions. Any non- compliance with these clearly explained guidelines will result in full loss of your security deposit and/or you will be asked to leave the premises.